The legitimacy and performance of the traditional criminal justice system is the subject of intense scrutiny as the world economic crisis continues to put pressure on governments to cut the costs of the criminal justice system. 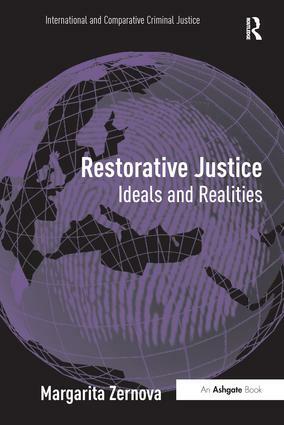 This volume brings together the leading work on restorative justice to achieve two objectives: to construct a comprehensive and up-to-date conceptual framework for restorative justice suitable even for newcomers; and to challenge the barriers of restorative justice in the hope of taking its theory and practice a step further. The selected articles start by answering some fundamental questions about restorative justice regarding its historical and philosophical origins, and challenge the concept by bringing into the debate the human rights and equality discourses. Also included is material based on empirical testing of restorative justice claims especially those impacting on reoffending rates, victim satisfaction and reintegration. The volume concludes with a critique of restorative justice as well as with analytical thinking that aims to push its barriers. It is hoped that the investigations offered by this volume not only offer hope for a better system for abolitionists and reformists, but also new and convincing evidence to persuade the sceptics in the debate over restorative justice. Theo Gavrielides is an international expert in criminal justice and human rights theory, policy and practice. His current research is at the cutting edge of restorative justice and juvenile justice. He is an advisor to governments and international bodies, and is a pioneer of user-led methods of research, policy and legislative reform. He is the founder and Director of the international think-tank Independent Academic Research Studies (IARS), and the founder and co-Director of the Restorative Justice for All international institute. He is also a Visiting Professor in Canadian and British universities.